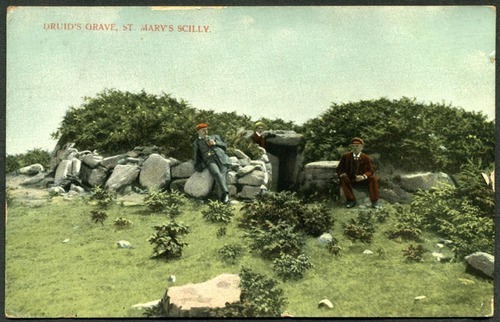 This postcard shows a view of one of the better preserved examples of the class of monuments known as Scillonian entrance graves. This type of construction was largely confined to the Isles of Scilly and the extreme west of the Cornish mainland and features a short entrance passage which leads straight into the burial chamber. Image courtesy of and © David Thomas. 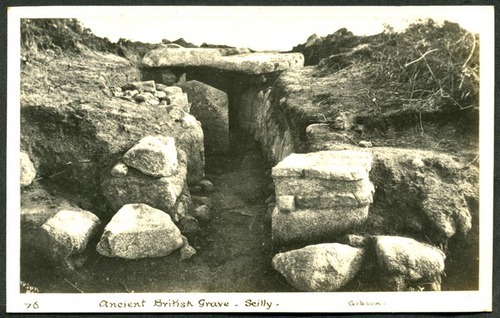 This postcard by Gibson shows another view of the entrance grave at Porth Hellick Down. H O'Neill Hencken used this same photograph as the frontispiece to his Archaeology of Cornwall and Scilly, and describes the barrow as "The largest passage grave [on the Isles of Scilly], which is also among the best preserved tombs in the islands, is one of a group standing near the edge of a high cliff on Porth Hellick Down on St. Mary's and is fairly complete except for the roofing stones of the passage. It shows especially clearly the revetment or retaining wall of dry masonry around the barrow which is common to all these graves. It also has an unusual feature which appears again in the Spanish peninsula, a large slab separating the chamber from the passage. This grave was excavated by Mr. Bonsor, but its contents had already been disturbed by treasure seekers. No human remains were found, but several fragments of pots were recovered as well as a piece of pumice stone."